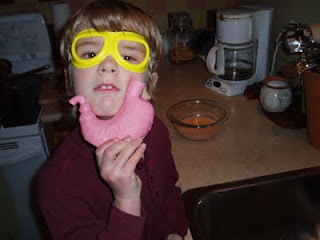 G. celebrated his birthday a little while ago and his mother sent us some of the pictures. If I have the story correctly (and I hope K. will correct me if I get it wrong), G.'s birthday was kept low key. 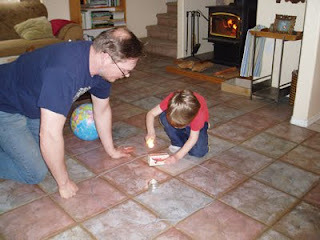 His Mom did an at-home version of the "ceremony" we use in the classroom. 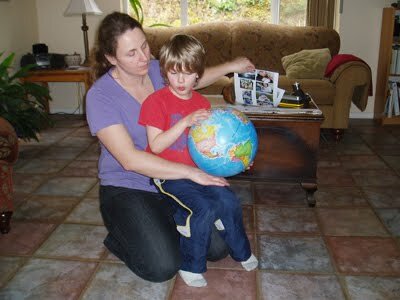 Holding the globe, G. & Mom discussed where he was born. 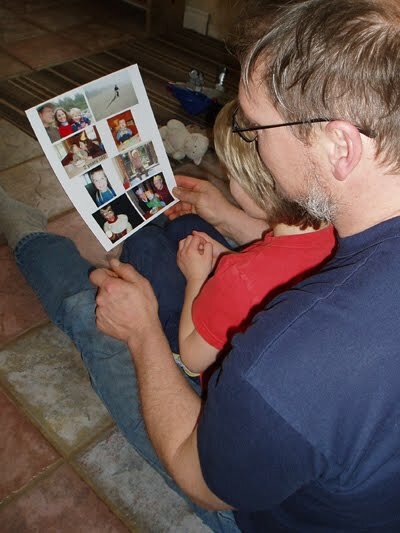 Then G. and Dad looked at pictures arranged in chronological order from the day he was born until now. G. lit a candle to represent the sun. Then, carrying the globe, he walked around the "sun" - one orbit for each year he was born. His Oma sent him some money in Swiss Francs and, after some discussion about what to buy, and a trip to the bank to have the money changed, his parents took him shopping. This is what he chose. 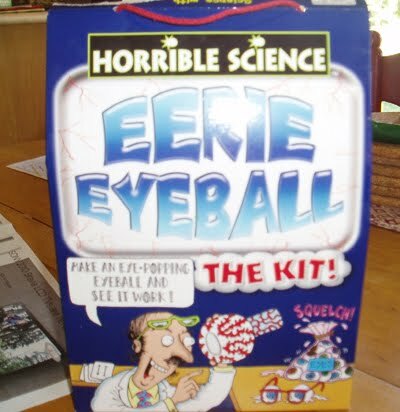 An eyeball kit for making and discovering all sorts of things about eyeballs. And (drum roll, please) the sick stomach! Yuuuuuuuuck! The activities that G. chose reflect the kinds of things he is interested in right now. The discussion beforehand prepared him for having to make choices in a small store. 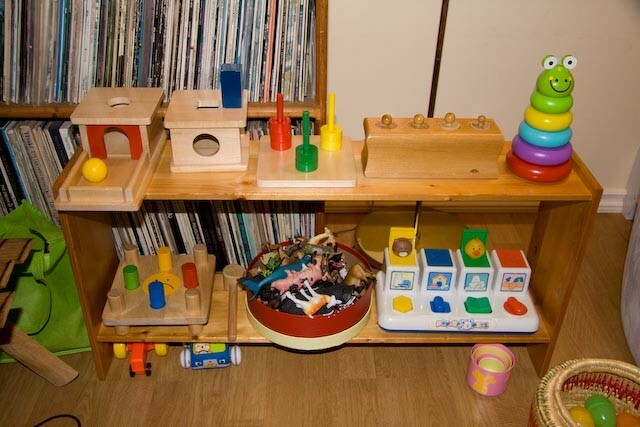 I know from experience that any preparatory discussion with a child will go right out the window if that child is taken into a big box toy store. Expecting a child to stick to his decision with thousands of choices in front of him is just not fair. Big box toy stores are waaaaay too stimulating and, in my humble opinion, are no place to take children. 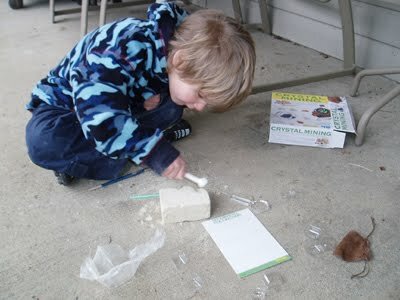 G.'s parents took him to a smaller local toy store where he found it much easier to make his decision. Having been in the store on other occasions, he already knew what to expect and had seen the science boxes before. 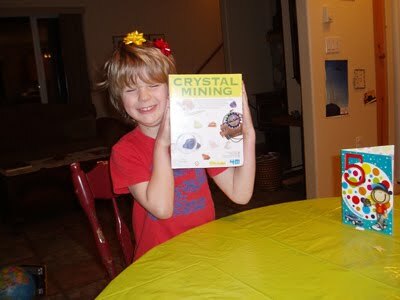 Choosing which kits to buy gave him valuable lessons in using money and critical thinking. What a great birthday celebration. 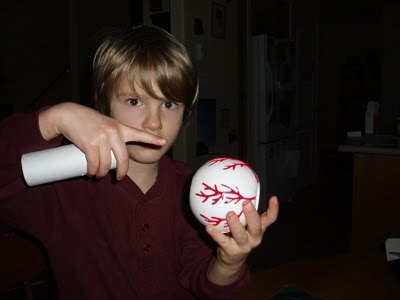 Looks like you picked some really cool things G! M. helps around the house.